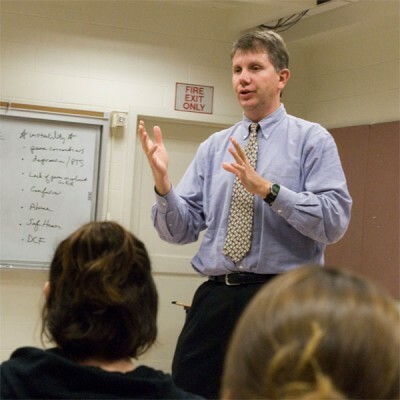 Dr. Joe Madaus teaching a course in Gentry 201. Photo by Jessica Tommaselli. Every battlefield has yielded its share of wounded warriors, but in the aftermath of U.S. involvement in Vietnam, the Gulf War and the conflicts in Iraq and Afghanistan, veterans with disabilities now receive as much attention for their cognitive and psychological impairment as they do for their physical wounds. For Neag Associate Professor Joseph Madaus, that attention must include greater opportunities for a college education. The disabilities in question are what Madaus calls the “hidden” type, including combat-related Traumatic Brain Injury, Post-Traumatic Stress Disorder and depression. With reasonable accommodations and modifications, many students with a broad spectrum of disabilities have demonstrated for years that learning is possible, as are successful outcomes. Now, he says, the focus must be on similar services geared toward the needs of combat veterans. I can see that without a strong support system, students could find the whole process of just enrolling too much to handle. As a graduate of UCONN I would hope the Universtiy would be a leader in this area.